Zarya, the low cost Fed 2. 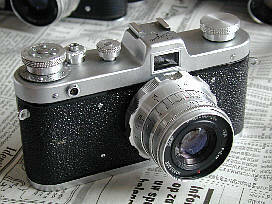 A camera completly identical to the Fed 2 but lacking a rangefinder. According to the book of Princelle, it was not a well received camera. People did not like it. I have no idea why. It has a bright finder. Weights less than a Fed 2, very easy to use and it looks cool. Voightlander had cameras like this and Zeiss. So why was the Zarya or Zaria so badly received? Pherhaps it was too expensive for a mere viewfindercamera. Still more than 140.000 were made and there were plans for a Zarya 3. I guess that the prototype was Zarya 1, the production model Zarya 2 and the Zarya 3.... never came. There is a rumour from the great book of Princelle that states that 60 Zarya 3's were sold. The only thing I don't like about the Zarya is the guessfocussing. The camera itself is wellbuilt. Very easy operation, but you have to have a lightmeter. It is one of the nicest cameras I've seen sofar.